The Santa Croce in Gerusalemme is an old Roman Catholic church that is just within the third century Aurelian Walls of the city. The church is architecturally and culturally rather unimpressive, but it is very important from a religious point of view. There has been a Christian place of worship at this location since the early fourth century, and the current basilica possesses many important Christian relics. 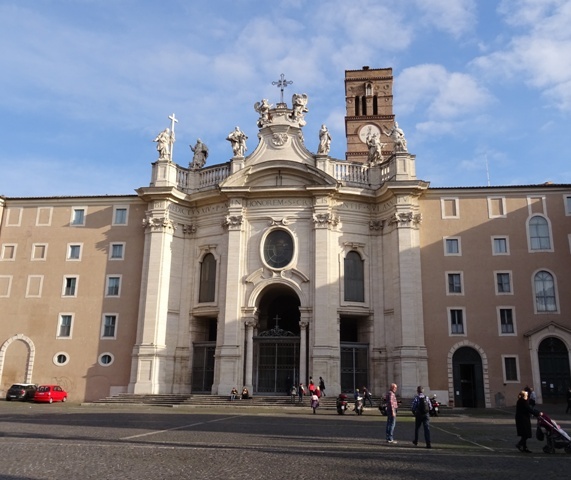 The Santa Croce is one of the traditional seven pilgrim churches of Rome. The spot where we find the Santa Croce nowadays was once the location of a palace known as the Sessorium or the Palatium Sessorianum. The origins of the name are obscure, but it was most likely built in the early third century under one of the Severan dynasty emperors. The Sessorium was a convenient alternative for the imperial palace on the Palatine Hill. It was located on the edge of the city, which made it easier to defend and – perhaps – to flee from if the situation in Rome became too dangerous for the reigning emperor. Part of the palace complex was an arena known as the Amphitheatrum Castrense. Much of this large structure has survived and can be seen to the south of the Santa Croce. It was incorporated into the Aurelian Walls when these were built after 271 and became part of the city’s defences. Regretfully, it is not accessible to the public. A circus known as the Circus Varianus was also part of the complex. Saint Helena on the church’s facade. The Sessorium was the residence for Constantine the Great’s mother Helena. Constantine had defeated his rival Maxentius on 28 October 312 at the Battle of the Milvian Bridge and had marched his troops into Rome soon afterwards. He immediately started favouring the Christians in the city, granting the terrain of the barracks of the equites singulares Augusti (the mounted imperial bodyguards who had fought for Maxentius) to Pope Melchiades (or Miltiades) and levelling the building to make room for a splendid new Christian basilica, the later San Giovanni in Laterano or Saint John Lateran, which was consecrated around 324. It is possible and quite likely that a chapel or palace church for Helena had already been built into the Sessorium by 320. Alternatively, it may have been constructed after Helena’s visit to Jerusalem, which according to tradition took place in 326/327. 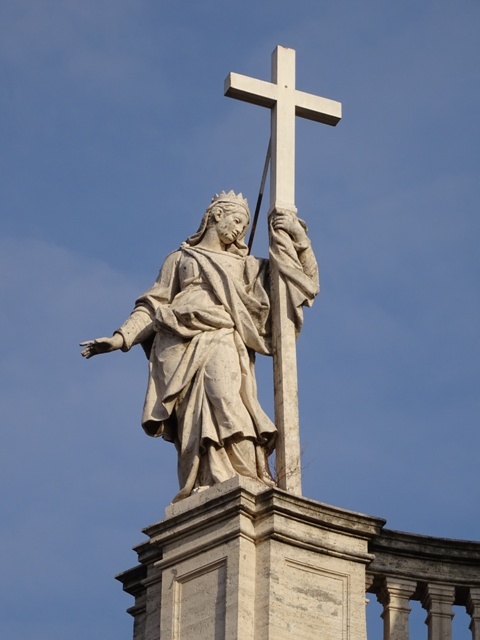 Tradition dictates that Helena found the True Cross and sent fragments of it back to Rome. She also collected many other relics and sent them to Italy to be displayed at the Sessorium. We do not know when the chapel or palace church was converted into a proper public basilica, but this must have been done some years after Helena’s death between 327 and 330. The basilica is mentioned as Hierusalem basilica Sessoriani palatii – the basilica of the Sessorian palace called Jerusalem – in documents dating from 501. The church was rebuilt during the pontificate of Pope Lucius II (1144-1145), born in Bologna as Gherardo Caccianemici dal Orso. He had been cardinal-priest of the church since 1123 or 1124. It was only after Lucius’ renovation that the basilica acquired its current name Santa Croce (Holy Cross). The renovation also provided the church with a charming campanile, which nowadays sports a rather strange one-handed clock. It is decorated with coloured ceramic dishes and most of the tower is hidden behind the church’s facade. The facade is not medieval of course, but clearly late Baroque. It was commissioned by Pope Benedictus XIV (1740-1758), and the Latin text on the facade indicates it was completed in the fourth year of his pontificate. The reason for the facade being slightly curved instead of straight, is that there is an elliptical atrium behind it. This can best be seen by using satellite view on Google Maps. You can also use Google Maps to have a closer look at the remains of the Amphitheatrum Castrense. Monks from the Cistercian order used the arena as a garden for growing fruit, vegetables and herbs until their order was disbanded in 2011 (you can read the juicy details of this affair at the Churches of Rome Wiki). A closer look at the apse fresco. The tomb of cardinal Francisco de Quiñones is in the middle at the bottom. Once inside the basilica, the visitor will notice that the interior decorations are not exactly awe-inspiring. The church is quite simple. Its nave is rather short and ends in an apse with interesting fifteenth century frescoes. These were once attributed to either Pinturicchio (1454–1513) or Perugino (ca. 1446-1523), but are now thought to be the work of Antoniazzo Romano (1430-1508) and his assistants. At the centre of the fresco is Christ the Redeemer, holding a book with the text EGO SVM VIA VERITAS ET VI(TA), which translates as “I am the way, the truth and the life”. This text is from John 14:6 (“Jesus saith unto him, I am the way, the truth, and the life: no man cometh unto the Father, but by me.”). Christ is painted inside a mandorla, which upon closer inspection turns out to be composed of little angels (cherubs). Below Christ and another ring of angels, we see a series of events related to the True Cross. On the left, Helena is talking to the inhabitants of Jerusalem to find out where the True Cross was buried. Next, we see men digging up three crosses on Mount Golgotha. One of the crosses is the True Cross, but which one? In the next scene, the True Cross is revealed when a dying man that is placed upon it is miraculously cured. Helena and the man can be seen praying. In the centre we see the raised True Cross, held by Helena, and next to it a kneeling man in cardinal’s robes. This man is cardinal Mendoza, titular cardinal of the Santa Croce from 1478 until 1495. All the previous scenes are set during Helena’s visit to Jerusalem in 326/327. The next scenes deal with the capture of Jerusalem in 614 by the Sassanid Persian king Khosrow II and the events that followed it. Khosrow carried away the True Cross and went on to besiege Constantinople, before the Eastern Romans counterattacked under their emperor Heraclius. Heraclius defeated the Persians in 628 and Khosrow died shortly afterwards. The Eastern Roman emperor then managed to take the True Cross back to Jerusalem in 629 or 630. In the final scenes of the fresco, we see Heraclius on horseback, triumphantly carrying the True Cross on his shoulder. He is then forced to dismount by an angel, as no mortal man may enter Jerusalem on horseback carrying the True Cross. After all, Jesus Christ himself entered the city on the back of a mule. Heraclius then enters the city on foot, as a humble man. In the apse, below the fresco, is the tomb of cardinal Francisco de Quiñones (ca. 1482-1540). He was not just titular cardinal of the Santa Croce (1527–1540), but also confessor of the emperor Charles V, the emperor whose rampaging troops sacked Rome in 1527 (the so-called Sacco di Roma). As confessor of the emperor, Quiñones turned a blind eye to Charles’ many love affairs (his illegitimate daughter Margaret was governess of the Netherlands between 1559 and 1567). 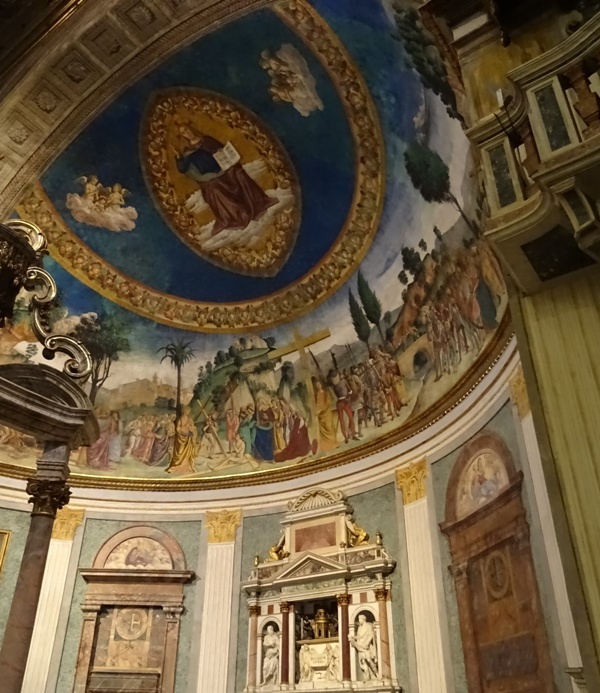 The cardinal’s elegant tomb, just below the part of the apse fresco that shows cardinal Mendoza, Helena and the True Cross, is the work of Jacopo Sansovino (1486-1570). Saint Helena holding the True Cross (centre), with cardinal Mendoza kneeling. The Santa Croce in Gerusalemme possesses many important Christian relics. These were all transferred to the Chapel of the Passion Relics in 1930. One can find thorns from the crown of thorns here, a nail from the crucifixion, Saint Thomas’ finger, the splinters of the True Cross mentioned above and many, many other relics. There is of course no convincing evidence that any of these relics are real. But that does not matter, because we are not talking about science here. The Santa Croce is all about religion, about what you choose to believe. Santa Croce in Gerusalemme on Churches of Rome Wiki.